Create special effects with the magic trident wand. Wave wand in front of door, and Disney's Ariel changes from a mermaid to a girl. Press down on the turret to make figures swim round and round. Water comes out of the fountain in front of Disney's Eric's castle. 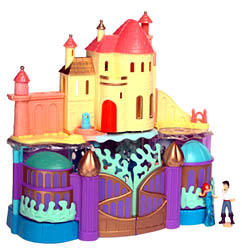 Playset includes playset, throne, bed, dinner table, bathtub, ship, trident, dressing table, fabric dress and 4 figures.